Nothing says holiday like a sugar-dusted cookie filled with jam. 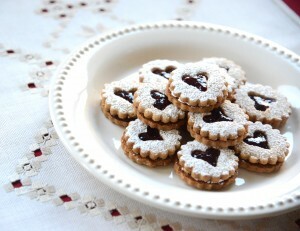 Linzer Torte cookies are scrumptious and gorgeous in equal measures. Made of toasted ground almonds, sweet butter and a whisper of lemon zest, these dainty cookies sandwich a filling of raspberry preserves. An adaptation of Austria’s classic Linzer Torte, these cookies are one of the simplest in my holiday repertoire. The dough comes together as quickly as any sugar cookie but for the extra step of toasting and grinding the almonds — a cinch in a food processor. I use a two-inch cookie cutter, with a heart cut-out, but they can be made any shape or size you wish — and filled with any sort of jam. Apricot preserves make a lovely alternative. If you like your cookies crisp, bake them a little longer and fill with jam the day you serve them. I prefer them on the soft side so I prepare them ahead of time. Either way, they don’t disappoint. Recipe adapted from joyofbaking.com, one of my favourite online resources. ** To use butter is straight from the fridge, measure 1 cup, then grate the firm butter into a bowl. This will soften the butter without having to wait for it to come to room temperature. Note: Before the cookies are baked, they’re placed on a baking sheet and firmed in the fridge. If you’re fridge looks anything like mine, you’ll need to make room. Alternatively, firm the unbaked cookies on a plate lined with parchment, then transfer them to a baking sheet when firm. Spread the almonds on a baking sheet in a single layer, and bake until lightly browned, about 8-10 minutes. When the nuts have cooled, tip them into a food processor with the white sugar and process until finely ground. In a separate bowl mix together the flour, cinnamon, allspice, baking powder and salt. In the bowl of standup mixer fitted with a paddle attachment, or a medium bowl, beat the butter with the brown sugar and lemon zest until the mixture is light and fluffy (about 2-3 minutes). Beat in the egg, ground almonds and the flour mixture until well incorporated. Remove one portion of dough from the refrigerator and run a hand over the parchment to make sure it’s rolled out evenly. Adjust if necessary with a rolling pin. Stamp out the cookies with the larger cookie cutter and place half on the prepared baking sheet, about 1 inch apart. Refrigerate about 15 minutes before baking. Use the smaller cookie cutter to stamp out the centers from the remaining cookies. Place on the prepared baking sheet, about 1 inch apart and refrigerate for about 15 minutes before baking. Re-roll any scraps of dough and cut out the remaining cookies. Bake for 10 – 12 minutes, or until lightly browned around the edges, rotating the pans once to ensure even browning. Remove from oven and cool on a wire rack. Spread a thin layer of jam on the underside of the cooled full cookies (good side facing down). Place the cooled cut-out cookies on a sheet of parchment (good side facing up). Place the powered sugar in a small sieve and dust the cookies with the sugar. Carefully, so as not to mar the sugar, place the sugar-dusted cookies on top of the jam-layered cookies, pressing them together. Using a small spoon, jam-filled piping bag or sandwich bag, fill in the heart cut-out with additional jam. Refrigerate in an airtight container for several days. If you are looking for some great recipes and tips in your inbox, then please subscribe to my newsletter.